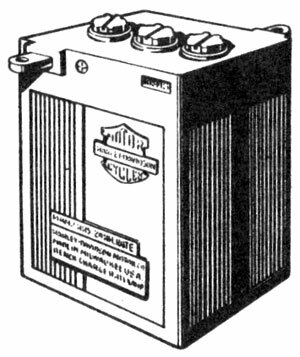 The Model 125 (1948-1952) and Model 165 (1953-1959) used the battery commonly known as the "H-3". 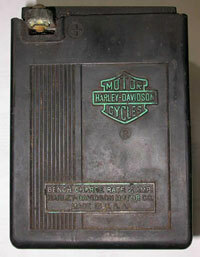 This battery was also used on the K (1952-1953), KH (1954-1956), and Sportster (1957-1964). 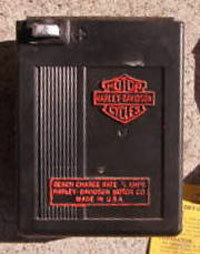 Production of these batteries probably stopped in the late-1970s, since the last bike to use them was the 1964 Sportster. 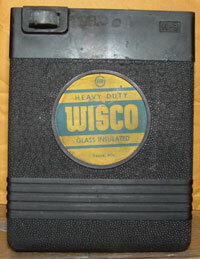 The aftermarket company WISCO also produced a H-3 lookalike, but they too probably stopped production around the same time. The original batteries are pictured further down this page, but it is highly unlikely you will find one today in usable condition. We'll give you some alternatives. 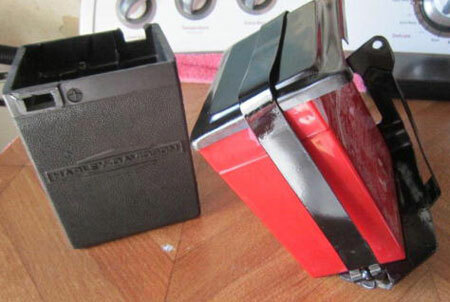 The best option for a Model 125 or Model 165 is to use a plastic look-alike shell with one (or two) smaller batteries inside. Several Club members (Duane Taylor, Leroy Lange) sell these shells. Check the "Parts" section of this website. The most popular smaller battery is the Power-Sonic PS-640F1 battery, available from on-line retailers (like Amazon) for about $11. These are sealed 6 volt batteries and are rated at 4.5 amp-hour. If you ride at night, you might want to use two of these connected in parallel to give you 9 amp-hours. Here's an example provided by Harry McGill #960, and a schematic for parallel wiring. 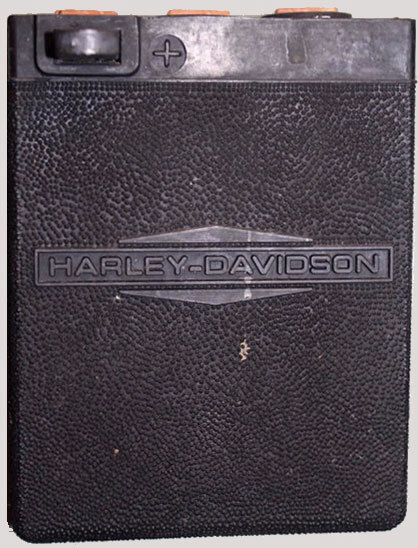 If you're going for AMCA judging, the Harley Hummer Club considers this the "best available reproduction". Note: the Power-Sonic PSH-655F1-FR is the same size, but has increased 5.5 amp-hour capacity. Unfortunately, harder to find. 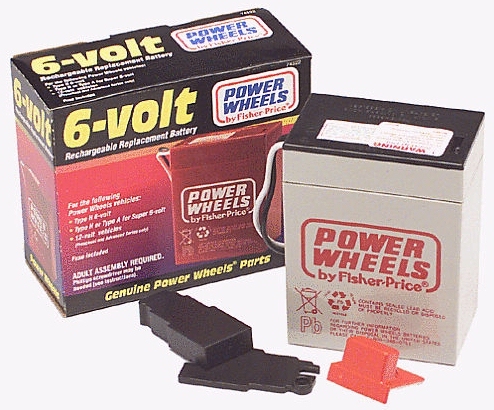 A less-expensive alternative would be to use a Power Wheels 6 volt battery designed for toy cars and motorcycles - around $35 at Toys-R-Us. These are the same height and width as the H-3 battery, so they won't fit inside the plastic shell (shown below). However, they will fit just fine inside the standard 125/165 battery tray on the frame, but the depth is about 1-1/4" less, as you can see in the picture below. They don't look as good as the shell does, but perhaps a coat of black spray paint might help. You'll also need to make some little wiring adaptors to hook the battery to the stock wiring harness. If you choose this route, we'd recommend getting the real Fisher-Price battery - some on-line retailers offer "equivalent" batteries at cheaper prices, but often there's a reason why they can sell for cheaper. 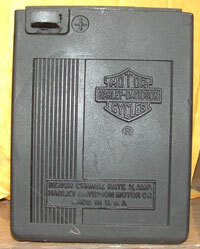 V-Twin Manufacturing has been selling a replica H-3 battery for many, many years. Over the years, Hummer Club members have repeatedly reported a very short battery life - like 1 year at best. V-Twin's catalog lists "Country of Manufacture: ‘Imported’". They don't look like the originals. They don't last like the originals. At V-Twin's suggested price of over $100, it'd be pretty expensive to replace them once a year. V-Twin sells a lot of good stuff, but unfortunately, these batteries ain't. The original batteries came in at least four different case styles. The production dates for the different colors are unknown, but our estimates are shown below. All known physical examples of this battery look like one of these. 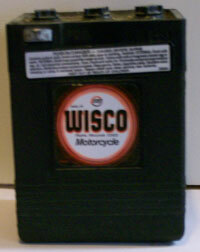 We also have pictures of an early and late aftermarket WISCO brand battery. After looking at the pictures, scroll down some more and read about the "Mysteries"
No Harley story would be complete without some mysteries. We've done the homework, but didn't quite find all the answers. 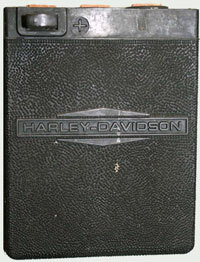 AMCA member Scott Lange searched through his K/KH/Sportster parts books and literature to help us complete the picture. Thank you, Scott. Mystery - the part numbers definitely changed from -47 to -47D in 1957. However, there appears to be no correlation between the part numbers and the physical batteries. * The "Replaced by" listing appeared in the 1957 catalog. It probably also appeared in the 1958 or 1959 catalogs. We don't have them available. "Moist-uncharged" v. "Wet-charged" v. "Dry-charged" v. "Export"
Back in those days, cycle and car batteries were usually shipped dry, and dealers and service stations had large packages of sulphuric acid with which to fill them. Perhaps the distinction was to allow the dealer to charge a dollar or two extra to fill and charge the battery. What "Export" means is a total mystery. What happened to -47A, -47B, and -47C? Mystery. We think these may have been engineering changes to provide a stronger battery for the K & KH - but they never made it into production. We'll continue looking, but this may be a question that never gets a definitive answer. The illustrations in all of the Hummer, K, KH and Sportster Spare Parts Catalogs up until 1965 show an extra line of text above the 3-line panel shown above. You can plainly see this in the illustration at left, although what it says is indecipherable. There are no known physical examples which exhibit the extra line of text. The left and rear sides of the illustration have a single panel with vertical lines. The right side (shown) has two panels. The illustrations are in black & white, so they give us no clue to the paint color. Here's an illustration from a 1963 Accessories Catalog. 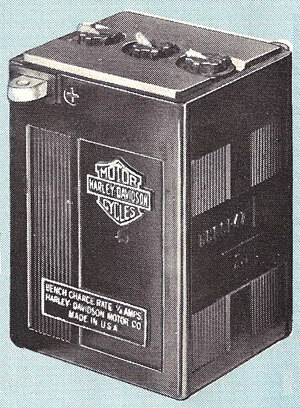 This appears to be a photograph of an actual battery rather than a drawing. This illustration appears in the 1960, 1963 and 1964 Accessories Catalogs and does not have the extra line of text. It also shows a different right side than the one in the Parts Catalog. The right side has four striped panels, with the part number - 66001-47 - debossed in the space in the middle. All known physical examples exhibit the 66001-47 number. Note that the front is painted. It's believed that they stopped painting about 1960, so this might be an earlier photograph. The K / KH / Sportster used the H-3 battery until 1964. The big twins changed to 12 volts and electric start in 1965. The Sportster also changed to 12 volts in 1965, but they hadn't figured out electric start yet. 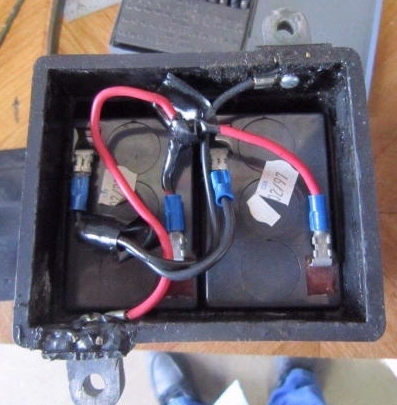 So, 1965-1966 Sportster used used two smaller 6-volt batteries. These are not H-3 batteries, they are the dual cell battery used in the '62 and later Sprints. These two years of XLH Sportster (but not XLCH) have an unusual "Hen's Teeth" battery tray. In 1967, the XLH Sportster gained electric start - and a car-sized 12-volt battery.